In the street, are we free of our movements and behaviors? To lose oneself in one’s own neighborhood, to discover its hidden dimension, to roam unsuspected spaces, to interfere in the interstices, to invente itineraries. “Playground” reconfigures a neighborhood for a collective experience of 60`. Participants desert the streets to invest gardens, courtyards and hidden spaces of the city. Playground draws an inverted map of the neighborhood and transforms the image that is made of it. The driving force behind this active wandering is a playful scenario involving three teams. The mission is to unlock a maximum of cells that make up a matrix covering the neighborhood. Equipped with smartphones and headsets, players build the inverted map of the neighborhood through their discoveries and actions. 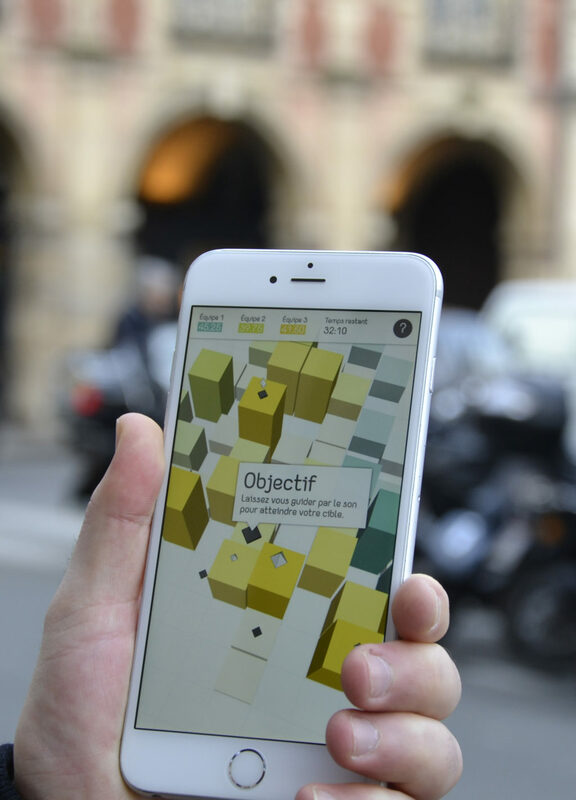 The augmented reality map turns into 3D sounds as you walk in the city. This evolutionary map is broadcast on a large screen visible to the public. By superimposing gameplay rules on the rules of the public space, playground emancipates the player from the norm and allows him to access a hidden dimension of the urban millefeuille. The challenge of this proposal is to question us about the programming and recurrence of our own behavior in the public space and our ability to thwart the urban machinery.